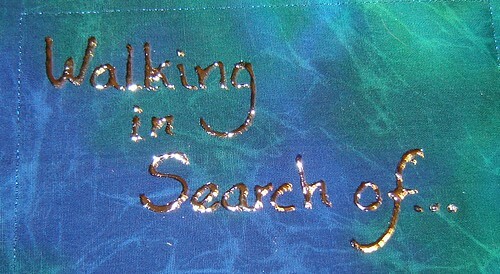 Whether to do the foiling first or last is a subject of debate amongst fibre artists, but largely it depends on what else you intend to do to the cover. Excessive handling can wear the foil off, as can running it under and iron or sewing machine. Since I know what else is going to be done to this piece, I can do the foil early and leave it to dry completely while I do another section fo the book. I used Jones Tones plexi glue as the foil base and I have to say that I love working with that stuff! The bottles it comes in are great, too – wonderful fine tip for applying glue carefully. While doing some of the foiling on the book cover, I took the opportunity to apply some to a small (8×8 inch) piece I’ve been working on for Abstract-Challenge. The theme was “winter”, so I started with a pen and ink drawing on fabric of a denuded tree, twisting it a bit and stretching it to look somewhat like a woman. 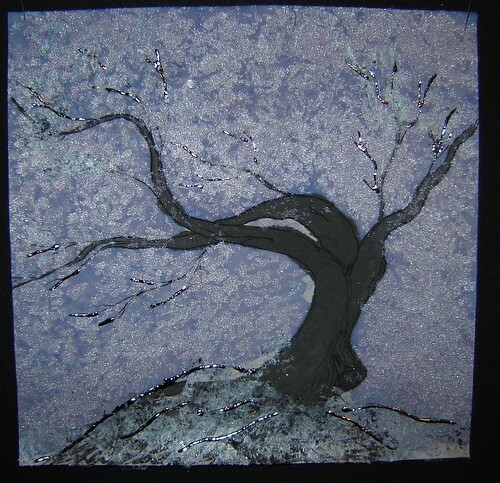 I then painted it with various fabric paints, applied painted fusible to the branches in spots to give the appearance of withered leaves and foiled in streaks of silver. Still have some work left to do on it, but it’s shaping up nicely. The winter pic is gorgeous. Just the right amount of foil.